Coral Reef With Schools of Fish. A look at the abundance of life found on coral heads. The fish appear to be schools of anthias of various kinds. This is the world that diving shows us! The Small Polyp Stony (SPS) corals have small polyps on a calcerous skeleton! The SPS corals have much smaller polyps than the LPS corals. LPS polyps are large and soft. SPS corals are usually either branching or plated. For the most part they enjoy bright light and strong currents. They are often fragile and are propagated by breaking off pieces. SPS corals used to be considered very challenging. A few discoveries in the last couple decades or so have brought them into the realm of the average aquarist. Nowadays it is not uncommon to see aquariums with various species of acropora, hydnophora, and other species of SPS corals growing and thriving. Since SPS corals usually occupy the reef flats in turbulent water, they require high light levels produced by VHO fluorescent or metal halide (see Mini-reef: Lighting) and strong water currents or turbulence. They also require very stable temperatures and excellent water quality (low organic nutrient levels) to thrive. Levels of calcium, strontium, and trace elements must be maintained. Sources vary on whether they need feeding or not. Probably some can be fed but it is not required to do so. What Are SPS and LPS Corals The coral reef is a beautiful world; comprised of anemones, mushroom corals, corals, crustaceans, and a myriad of other incredible animals. The word coral itself brings to mind the reef building hard corals, or stony corals. Stony corals produce a skeleton of calcium carbonate, which then becomes the foundation and building blocks of the coral reefs. The Small Polyp Stony (SPS) Corals can have complex elegant shapes, and dazzling colors. Convenient terminology in the aquarium industry is used to describe stony corals as either SPS corals (small polyp stony corals) or LPS corals (large polyp stony corals). What they look like becomes immediately obvious when you compare the size of their polyps. SPS have much smaller polyps than the LPS. Though this generally works pretty well for the aquarist in recognizing a particular type of coral, it isn't an exact description. There are occasional coral species whose polyps don't fit the norm of their group, being too large or too small. From a scientific perspective, there is little objectivity and no real correlation between polyp size and classification. Keeping a bit of coral reef in the home aquarium is an exciting and rewarding adventure. Reef tanks were once considered very difficult to keep. Keeping live coral is still somewhat demanding, but today the knowledge and equipment are readily available to the average hobbyist. Anyone with the desire to learn specific husbandry techniques and the willingness to purchase the proper equipment can keep a gorgeous reef aquarium. Of course the aquarist must invest his or her time in the care of these unique animals as well. 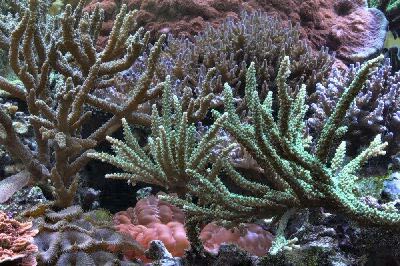 Beautiful home reefs can be either a simple reef with hardier, less demanding animals, or a more complex reef with higher maintenance specimens. Stony corals are more demanding and take a more dedicated effort. So keeping stony corals is itself a step beyond a simple or beginner reef. Having reef-keeping experience is invaluable to successfully keeping hard corals. With some of the less demanding inhabitants you can hone your skills. You will develop an understanding of the unique habitat these animals thrive in. Some of the best inhabitants for a beginning reef are soft and leather corals, coral anemones, and anemones. Once you've gained success in keeping these, you will be ready to keep the more delicate and demanding stony corals. Corals For Sale Experience over the last few decades has strongly indicated that captive bred stony corals are much more adaptable and hardy than wild caught specimens. So it is better to acquire captive bred small polyp stony (SPS) corals or coral frags when possible. You'll not only get a more durable coral, but there are often many beautiful color morphs available.